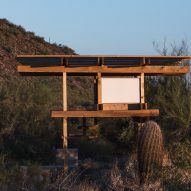 Architecture student Jaime Inostroza has built a tiny pavilion on the campus of the School of Architecture at Taliesin, offering occupants framed views of the Arizona desert. Inostroza recently graduated from the architecture school – previously called the Frank Lloyd Wright School of Architecture – which is based at a house designed by the prolific American architect in Scottsdale. Inostroza was one of several students asked to design a pavilion suitable for sleeping inside, to test their understanding of design, materials and construction. But only this one was built. Inostroza's design was for a structure with an elevated bedroom, offering views of the surrounding desert landscape. It is built in a clearing, among dense vegetation that offers shade. Concrete pads already existed on this site, thanks to a previous construction here. The new pavilion sits on top, supported by stilts that bring it up to the level of the surrounding trees. The student calls the pavilion Atalaya, a word that means the crow's nest at the top of a ship's mast. 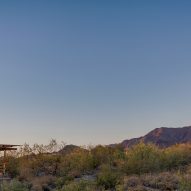 "As a young architect Taliesin is a great laboratory where you can test principles in architecture," Inostroza told Dezeen. 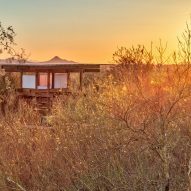 "I was able to set out and design and construct a raised sleeping loft as tall as the nearby trees, where [the occupant] could watch the play of light and colour across the desert landscape." Taking cues from Wright, Inostroza designed the structure with strong horizontal lines that follow the vast landscape. These include an overhanging flat roof, which is topped with panels of corrugated polycarbonate. The wooden beams are thicker than the vertical columns to further enhance the horizontality of the pavilion. Also in the style of the famous American architect, Inostroza chose materials to blend in with the natural surroundings. This includes red western cedar for the structure and lightweight translucent material panels. The use of red western cedar could also be attributed to Wright's influence – he often chose it for its natural tones. 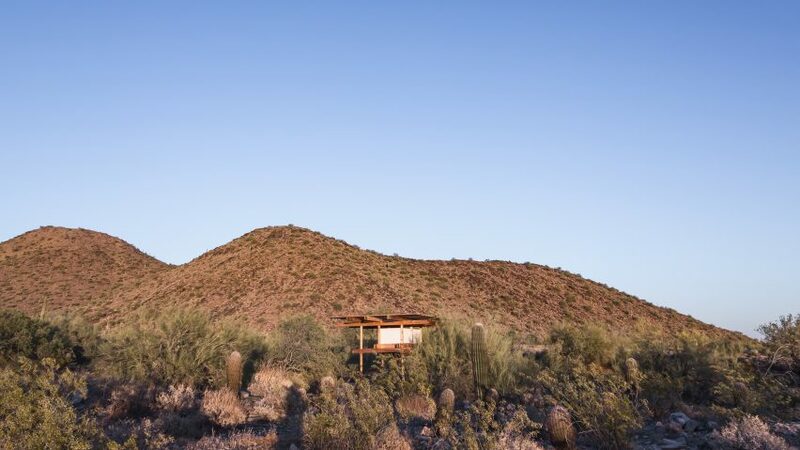 Underneath, Inostroza extended the existing concrete pad with a wall made using the same concrete and stone combination of the Taliesin West buildings. It encloses a sheltered sitting area underneath the bedroom, while also forming a set of steps leading up to the wooden structure. Frank Lloyd Wright founded his school of architecture in 1932, to offer apprenticeships for a small number of students. Today, teaching is split across the campuses of Taliesin, Wisconsin and Taliesin West, Arizona – both designed by Wright. This month marks the 150th anniversary of Wright's birthday. A series of events took place across the architect's buildings in the US to celebrate the occasion, while New York's MoMA opened a major retrospective exhibition of his drawings and models. Dezeen is commemorating the occasion by spotlighting some of the architect's key projects, including his Fallingwater house, Robie House, Hollyhock House and Taliesin West. Photography is by Andrew Pielage.